Late October 2015 in the Egyptian resort of Sharm El-Sheikh, Latin America won the Girls’ Team title at the ITTF World Cadet Challenge; it was a landmark moment for the continent, the architects of the victory being Puerto Rico’s Adriana Diaz and Brazil’s Bruna Takahashi. They are the two principal names on duty in the Women’s Singles event at the forthcoming Buenos Aires 2018 Youth Olympic Games Latin American qualification tournament. Play starts in Santo Domingo, Dominican Republic on Friday 12th May. Choosing between the two teenagers, who have very much set new standards in their part of the world, is a most difficult task. The most recent results on the international scene endorse that fact. In early 2016 they met in the Women’s Team event at the ITTF Latin American Championships, the verdict went in favour of Bruna Takahashi; some six months later they crossed swords once again, in the final of the Girls’ Singles event at the Panam Junior Championships. On that occasion Adriana Diaz prevailed. Now, if we consider 2017, arguably the balance is in favour of Adriana Diaz. Currently on the Under 18 Girls’ World Rankings, she stands at no.7; it is the highest of her career, Bruna Takahashi is at no.23. A notable gap; one reason is that Adriana Diaz has been the more active and the more successful player internationally since the start of the year. 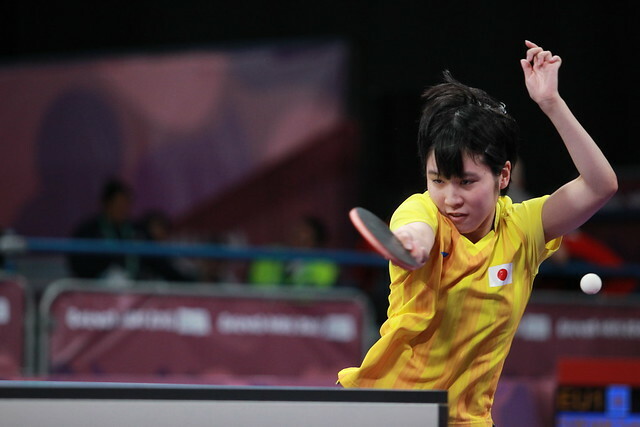 Bruna Takahashi appeared on the ITTF Challenge Series in Belarus and most recently in Brazil, there was no great success on her European travels but on home soil in São Paulo, she won the Under 21 Women’s Singles event. However, with respect to the players who competed in São Paulo, the level of opposition which Adriana Diaz has faced and beaten has been much higher. On the ITTF World Junior Circuit, she was the Junior Girls’ Singles runner up in Sweden, a quarter-finalist in Italy. Furthermore, in Under 21 Women’s Singles events at ITTF Challenge Series tournaments, she was a semi-finalist in Belarus and Croatia, the winner in Slovenia when overcoming Japan’s highly rated Saki Shibata to claim gold. Somewhat conversely, intense training on foreign soil, notably in Denmark, has been the agenda for Bruna Takahashi. The question posed and to be answered in Santo Domingo is which has proved the more suitable preparation; intense competition or intense training? They may well meet in Santo Domingo but with two places available for the Buenos Aires 2018 Youth Olympic Games; they are odds on favourites to qualify. There is no player on duty in the Dominican Republic capital city who can compare with the achievements of Adriana Diaz and Bruna Takahashi; the one consoling factor for the rest of the field is that they are under no pressure whatsoever, they can express themselves. Next in line is Ecuador’s Nathaly Paredes and Paraguay’s Leyla Gomez, the finalists earlier this year in the Junior Girls’ Singles event at the South American Junior and Cadet Championships, the former emerging the winner. They complete the top four names in a tournament which follows a very simple formula. All players enter the first knock-out event; the winner qualifies. A second event on the same basis is organised, the winner qualifies; the runner up is the first reserve with the losing semi-finalists playing for the second and third reserve places.